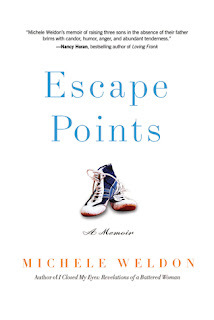 Escape Points by Michele Weldon is a very highly recommended memoir about a single mother trying to raise three sons (with an absent ex), and survive cancer. Escape Points chronicles twenty-five years of her life after her divorce. She divorces her physically and emotionally abusive ex-husband when their boys are young (6, 4, and 1). He then removes himself completely from their lives (and doesn't pay any support). Weldon shouldered forward, carved out a career for herself, and made a life for her and her boys. This included many, many wrestling matches for all three of her boys. As she is struggling to keep everything together, she receives the news that she has cancer and now must now juggle daily radiation treatments. "You can do it all. You just cannot do it all well all of the time..... Trying to make the most of the life you have been granted is a noble thing to do. And the grace arrives." "I knew I could not make up for the father who left my sons. I may never be able to forgive myself for choosing a man who would treat our sons this way. But his story is not mine. Mine is a story of what happens when the door closes and you stand waist-high in the murky puddles brought on from someone else’s tsunami. When the shock of the water subsides and you realize you would never drown, you count your blessings." Weldon feels guilty that she chose to marry someone who would go away; someone who would willfully leave his children and place his desires first. "I could do my part, but I could never do both parts." This realization caused her to seek out and turn to men of honor who could be a good male role model, including her brother and an incredible wrestling coach who went above and beyond the norm to take care of all of his "boys". I just wanted to hug her when Weldon wrote: "Children can forgive many things - the hurts, the failures, the mistakes. But they cannot forgive you forgetting that they come first." Yup, all children, even older children, want the knowledge that they are loved unconditionally. And it hurts when they aren't. I also sort of want to hang out with Weldon and swap stories, especially when her non-support paying ex sent the boys these odd messages about his needs and desires without ever once saying he was sorry for everything he had done to them, and then asking for their forgiveness. Weldon noted that: "I heard a story on NPR a while back about a 108-year-old woman who managed to outlive and outwit most of her family and friends. She had what experts called 'adaptive competence,' a powerful trait that allows and inspires you to view your life as half full regardless of setbacks. I think I have that. I know my sons do." I wish them all the best. The memoir is well written and organized by dates so you can keep track of the time period. While I'll be the first to admit that not all parts held my rapt attention (I like wrestling but I did skim through some of the wrestling match discussions), I think, in totality, this is an excellent memoir and should resonate deeply with the many single mothers out there raising sons. Disclosure: My Kindle edition was courtesy of Chicago Review Press for review purposes.